5 Ways To Make Self Care A Priority | Are You Taking Time For Yourself? Is self-care on your radar or are you in survival mode? Many of us today can barely find the time to pay the bills and feed the kids, let alone take time to nourish ourselves both physically and emotionally. When did we get so busy and frazzled that our own needs got relegated to the back burner? It’s no wonder health care costs continue to rise, with divorce rates steadily climbing, and mental health concerns, such as, depression and anxiety increasing as never before. It’s time we brought regular self-care back on board. Here are 5 ways to make self-care a priority! 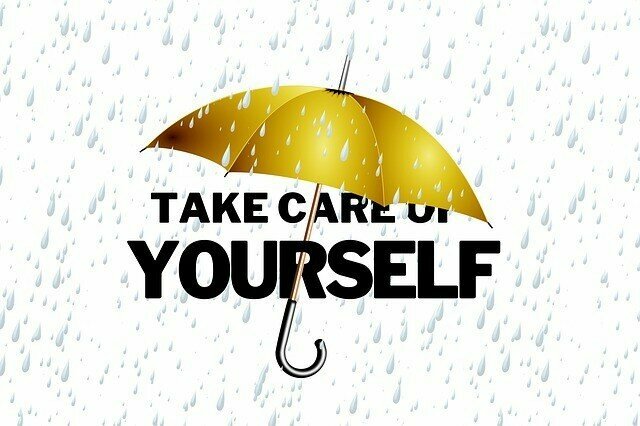 Self-care is the practice of improving and protecting your health, happiness, and well-being, especially when life’s stressors are pressing in against you, making it particularly difficult to take time for yourself. Self-care is especially vital during times of stress. None of us can give from an empty cup, so let’s work on filling that cup and keeping it full, making ourselves and those around us healthier and happier. Self-care is a choice. Once you’ve made this choice, take time each day to do something that nourishes you physically, emotionally, mentally, and spiritually. A self-care activity doesn’t have to take two, three, or four hours. That would cause more stress as you probably don’t have that much discretionary time at your disposal. What about the one-hour rejuvenating get-aways that go a long way in shoring up our self-care stores? These short, but consistent bursts, of enjoyment and relief make a significant difference to your physical, emotional, and psychological health and well-being. A little self-care makes all the difference if your attitude and outlook have taken a nose dive. Self-care is taking responsibility for yourself. It is an attitude and a commitment to honor and take seriously. In fact, it’s neglectful when self-care is not a priority, that’s how necessary it is. The first step to effective self-care is realizing it’s okay to make time for yourself. First, give yourself permission, and the following steps will be easier. Decide today that self-care will be an integral part of your life from this day forward. Next create an action plan where you map out activities you’re excited about. We’ll talk about ideas below. Schedule yourself into your life, and then stick with that plan. After a while you’ll realize how much you’re enjoying your self-care schedule, wondering how you ever managed without it. Here are some self-care ideas to spur your imagination. Self-care looks different for each of us. A self-care activity that feels good one week may not be so appealing the next so shake things up. Do what feels good to you in the moment. Exercise: I don’t know about you but exercise clears my head, helping me reflect on what really matters in life. Go for a bike ride, workout at the gym, or take a dance class. Dancing is always invigorating. Walk in nature: Go by yourself or walk with people that are good listeners, bouncing ideas off them if you need an objective opinion. Talking about issues helps to clarify them, strengthening relationships at the same time. Stretch: Gently stretch all your muscles for a few minutes everyday, while breathing deeply. You’ll reset your nervous system, and keep your muscles pliable. Get a massage: Nothing is more relaxing than a massage. Consider booking a session at the local massage school, making it very affordable. Relax in the sauna: I’m spoiled because I have my own sauna. It’s a luxury spending time detoxing. Many gyms and salons have saunas so consider visiting one to see how you like it. It’s good for both your mind and body. You can purchase your own Far Infared sauna here. Art: Jigsaw puzzles, coloring, painting, ceramics, pottery: any creative act gets you into your right brain. Don’t be surprised if new ideas and insights come to you at these times. Here is a great set of markers to use with your adult coloring books. You might just get addicted! Crafts: Sewing, knitting, crocheting, needlepoint, jewelry making; anything crafty will do. I like the sense of fulfillment I feel after finishing a project, and it gives my left brain a much-needed rest. Gardening: Time spent in nature is never wasted. It’s healing and rejuvenating. Go get your hands dirty. Make a topiary, plant some vegetables, or pot some flowers or herbs. It’ll make you feel productive. Baking: Bake a pie, decorate a cake, or whip up some fluffy rolls, all in your spare time. Your family will love it, or give a plate away to a lonely neighbor that would welcome a smiling face. Journaling: Documenting your thoughts and experiences puts them into perspective, and frees up your brain power. Writing is therapeutic ,that’s why it’s so often recommended for anyone on a healing journey. Reading: There’s simply nothing better and more relaxing than reading a good book. Watch a movie: You know that movie you missed when it first came out, and is now on Netflix? Go sit in the bath and watch it. Even better, do it in the middle of the afternoon. You’ll feel like you’re bucking the system. Listen to music: Who takes the time nowadays to just relax and listen to music? Who knows, maybe a solution to that pesky problem that’s been bugging you will appear when you’re still. Better yet, create your own music if you play an instrument or sing out loud to your favorite songs. If you’re really brave, grab some friends and try your hand at karaoke. Here’s an awesome karaoke microphone you can use with your smartphone. Renew old friendships: Set up a coffee or lunch date with long lost friends, and reminisce about old times. Foster budding friendships: Reach out to that special person you’d like to get to know better. Every new person you meet has something to teach you, and will add new a dimension to you life. Picnic in the park: Grab your favorite people and spend an afternoon at the park. Fly a kite, play frisbee, do some handstands, while indulging in your favorite food. What I really want you to do is go swing on the swings. Don’t you remember how fun that was as a child? Play is the name of the game here! Spend time with pets: Who doesn’t love spending time with pets? They have no agenda and give unconditional love at all times. Go for a walk, cuddle on the couch, or play fetch. Learn something new: Throw caution to the wind, and learn something new. It could be anything. The point is to get out of your comfort zone, boosting your self-esteem and confidence. Take a nap: Nothing else will do when you’re tired. Cozy up on the couch and take that much-deserved nap. Life seems easier when you’re not exhausted. Meditate: Calm your fears and frustrations through meditation. My strength and courage are always renewed after a relaxing meditation session. I like to lay on my back in the sun, basking in the warm rays, while clearing my mind. Daydream: This honestly is one of my favorite activities. It improves both my mood and attitude. Daydreaming in a warm bath filled with essential oil and epsom salts is simply the best. Organize: I put this one in as a self-care activity because I love organizing. I find it very restorative. You know that tin of grandma’s old buttons you’ve been wanting to organize. I dare you to take an hour and go do it now. It’s cheaper than therapy. If you’re really ambitious go tackle your closet. Did you know self-care is a verb? If you’ve scheduled time for yourself, and someone else needs you, kindly say: “Today I am self-caring, but I’ll be back in the loop tomorrow.” You don’t have to tell them you’re on your way to get a mani-pedi. It’s nobody’s business how you invest in yourself. Better yet, make a full disclosure of what you’re doing and why! I hope I’ve convinced you how important self-care is. Prevent illness, boost creativity, and increase productivity all at the same time by investing in a self-care schedule. The benefits will far outweigh the time and energy it requires. You know that calendar you’re endlessly adding things to? Practice penciling yourself in. Block out chunks of time just for you. There’s really nothing more important! How are you doing on self care? Is it a priority or have you let it slide? Please take the time to leave a comment or suggestion below. It’s helps everyone reading this post.